Do we provide a gift wrapping service? Yes, we are happy to gift wrap items if requested. We will then wrap the box in a tasteful gift wrap and enclose a hand written gift card with your message to the recipient. The item will then be packaged and sent using the Royal Mail signed for service. This is a great way to send gifts for birthdays, Christmas and special occasions to a friend or loved one. The charge for this gift wrapping service is £4.00 and can easily be selected when checking out. Why are distance courses more expensive? When students attend our one day workshops their time is limited to 5 hours and they share the tutor contact time with other delegates on the course. With our distance learning courses you have unlimited contact via e.mail with your tutor for a whole year after enrolling. Some of the items used on our one day workshops are shared between the students and are returned to the tutor at the end of the course. Distance learning embroidery packs have all these supplies included. Do I receive a certificate on completion of the course? All delegates attending or taking our online courses receive a certificate and following discussions with our students, have split these into two types. For those who just wish to have their attendance to the course acknowledged. Delegates send us digital images of their finished course piece(s) and are in return awarded a Certificate of Achievement. We give you plenty of time (6 months) after the course to send in your images so that students do not feel pressured by time. 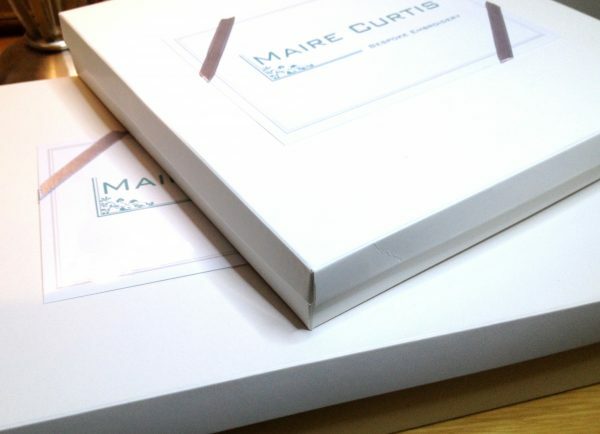 The certificates issued by Maire Curtis Bespoke Embroidery will detail the skills you have learned and are useful if you wish to attend courses by other providers who may wish to see proof of your prior learning. How long are your vouchers valid for? Our course vouchers are valid for one year from the date of purchase. They have no cash value. In order to comply with the law, any refunds from a voucher purchase will also be made in vouchers of the appropriate amount. See “What happens if I cancel my course” for more information. Can we visit your studio? Sorry, we cannot accommodate visits to the studio. We take your security very seriously and never give details to a third party. All online payments are dealt with via PayPal, for our security as well as yours. We have no access to your credit or debit card information and no such details are stored in accordance with the law. Do you carry out restoration work? We do not restore embroideries or lace works. The best thing to do in the first instance is to contact the Royal School of Needlework. Do you embroider ready made items? As a general rule, no we don’t. All the items we produce are made in our own studio. We will have ring frames, neck magnifiers, scissors and needles available on the day. If you use glasses, please remember to bring them with you. Can I purchase materials from you on the day? Everything you will need to complete the course project will be provided. However, some items such as cotton bobbinet tulle and organdie for Carrickmacross lace are very difficult for people to purchase in small quantities, so we do bring a limited supply with us for people to purchase on the day for future projects. Please let us know if you want anything in particular so that we can bring it with us. We do suggest that you bring cash, as broadband in the Lake District is flaky which may restrict the use of our card terminal. We will also accept cheques up to the value of £50 if addressed on the reverse. There is also the ability to send you a proforma Paypal invoice so that all you have to do on the day is pick up your goods. Unless otherwise stated, the course is held in a suite on the first floor to which there is no lift. We may be able to arrange an alternative course date at a suitable venue, so it is always worth contacting us to find out more. We include all our course materials, refreshments and lunch in the course fee. We choose our course venue carefully so that there will be adequate parking for delegates. Carlisle Courses – There are a number of Pay and Display car parks within a few minutes of the venue. Hundith Hill – There is plenty of free parking on site. What happens if we cancel a course? We reserve the right to cancel a course should it be necessary. In the rare event that this should happen, we will refund all course fees or offer you a place on another course if suitable. What if I need to cancel my course? If you need to cancel your course, please let us know as soon as possible. For cancellations for any reason outside 7 days of the course date, we will refund your course fee less £25. This is to account for materials already purchased, the booking fee at the venue and the possibility that we cannot get anybody else at short notice. If you cancel for any reason within 7 days of the course date, we can only offer a refund (less £25) if we can fill your place. I we cannot or you fail to attend, we cannot refund payment. In the case of voucher payments, the same will apply. However, in this case we can not offer a cash refund but will offer another voucher valid for the appropriate amount which you may use on future courses. You may transfer your booking/voucher to a friend or relative, but we need to be informed of the change before the course date.